An emperor penguin that became an international star after being washed up in New Zealand hundreds of kilometers from his native Antarctica finally set sail for home Monday. Happy Feet left Wellington aboard the New Zealand National Institute of Water and Atmospheric Research (NIWA) research vessel, Tangaroa, after spending two months in Wellington Zoo. The penguin, who was found exhausted and hungry on Peka Peka beach on the North Island’s Kapiti Coast, left the zoo in a travel crate specially designed to keep him cold and comfortable during the voyage. The bird will be released from the Tangaroa, which is heading south on a month-long fisheries survey around Campbell Island, about four days out to sea at about 51 degrees south, within the penguin’s natural habitat of the Southern Ocean. Dr Lisa Argilla, manager of veterinary science at Wellington Zoo, said Happy Feet was in good spirits and ready to go home. “Happy Feet is in good shape and the team at Wellington Zoo are very excited that the time has come for him to be released back into the wild, where he belongs,” said Argilla. Argilla is accompanying Happy Feet home on Tangaroa, assisted by two NIWA science staff, who have been specially trained to feed and care for the penguin. A final decision on exactly how Happy Feet would be released had yet to be made, she said. Options included releasing him down a purpose-made slide off the stern ramp of the vessel or using an inflatable boat, but it would depend partly on the weather and how Happy Feet responded. The wayward emperor penguin Happy Feet had every chance of reuniting with others of his species, said Associate Professor John Cockrem, of Massey University’s Institute of Veterinary, Animal and Biomedical Sciences. Cockrem, who had spent three weeks studying stress response in emperor penguins at a large colony at Cape Washington in Antarctica in 2004, had advised New Zealand’s Department of Conservation and Wellington Zoo on the care of Happy Feet. The area where the penguin would be released was far enough south to meet the sea currents that would steer him towards Antarctica. NIWA chief executive John Morgan said NIWA staff were happy to be hosting their star passenger. “I’m not sure we’ve had anyone as internationally famous as Happy Feet onboard before, but I’m sure he’ll be well looked after, ” said Morgan. 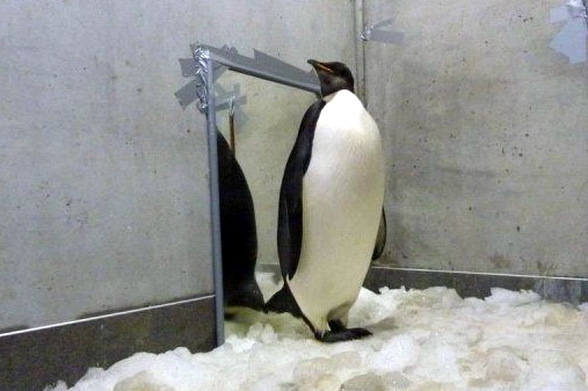 Happy Feet has been fitted with a satellite tracker and a microchip, so fans can follow his progress on the Wellington Zoo website (www.wellingtonzoo.com). Daily updates from the Tangaroa on Happy Feet’s progress will be available on www.niwa.co.nz or www.wellingtonzoo.com. The Tangaroa, New Zealand’s only deepwater, ice-strengthened research vessel, is equipped for a wide range of environmental survey and ocean science work, including fisheries surveys, and works throughout the South Pacific, Southern Ocean, and Antarctica. Happy Feet was given a clean bill of health last month after X- rays showed his stomach was clear of sand and debris he had swallowed before he was found in June. The penguin, who drew international attention and inspired headlines such “The Lost Emperor” after his arrival in New Zealand, had put on 4 kg during his stay at the zoo. Happy Feet, who is 90 cm tall and now weighs about 26 kg, had been full of sand, which experts thought he might have eaten after mistaking it for snow, and emaciated when he arrived. He is the first emperor penguin known to have reached New Zealand shores since 1967, and experts are still uncertain as to why he arrived, speculating that he lost his way while searching for food or became caught in an ocean current. Emperor penguins are the largest penguins, growing more than a meter tall and weighing up to 30 kg. They feed on fish, krill, squid and other marine invertebrates and can live for up to 30 years. They have been known to dive to 450 meters below the ocean’s surface and survive 11 minutes underwater. Previous Previous post: New York Gov. has declared a state of emergency as Irene nears. Next Next post: Star of Leo is a complete mystery.